Child migrant crisis: Obama says there’s a “humanitarian crisis” at our border—but he’s treating it like a simple immigration problem. The president says there’s a “humanitarian crisis” at the border—so why is he treating it as a simple immigration problem? 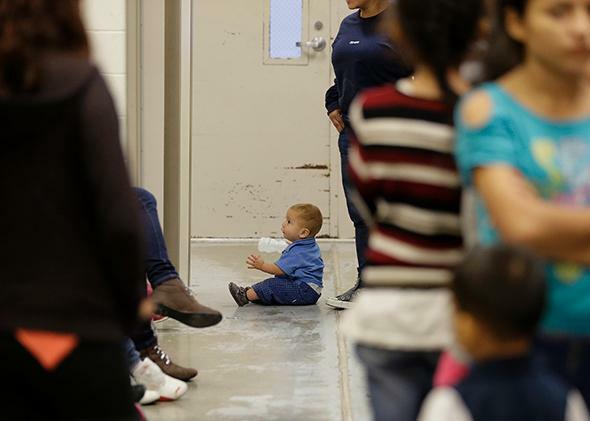 A toddler sits on the floor with other detainees at a U.S. Customs and Border Protection processing facility, on June 18, 2014, in Brownsville,Texas. Immigrant children continue to pour over the United States’ southwestern border at a rate of more than 1,000 per week. President Obama is offering up a simple solution: Make it clear that if the unaccompanied children somehow survive the dangerous trip, the U.S. government will move as fast as it possibly can to send them back home to the countries they fled. That tough-love approach suggests that even though the president has taken to calling the influx of migrant children the “humanitarian crisis on the border,” in reality he believes it’s better dealt with as an immigration issue as opposed to a refugee-like problem. The difference is more than semantics. If the president is right, his plan will stop or at least slow the influx of migrant kids that currently have ground much of the U.S. Border Patrol largely to a halt. But if he’s wrong, as many immigration and child-rights advocates warn he is, the plan won’t only fail to stem the tide, it could also place thousands of children in serious jeopardy. The exact details of what Obama’s trumpeted as “an aggressive deterrence strategy” will be sent to Congress sometime this week, and come on the heels of the promise he made in the Rose Garden last week to go it alone on more sweeping immigration reform. The child-migrant proposal is expected to include compassionate measures—such as providing more resources to make life better for the tens of thousands of kids currently in government custody without a bed to sleep in. But the White House has made the centerpiece of the plan a change in immigration law to expedite the deportation process. Update July 8, 2014: The president sent a formal request to Congress on Tuesday for $3.7 billion to help deal with the crisis. That request—for nearly double the amount the White House had floated last week—does not include changes to current immigration law, but Obama made it clear in his letter to House Speaker John Boehner that he will push for related legislation that would rewrite the existing law to speed deportations. The tweak, if approved by Congress, would allow federal border patrol agents to quickly deport a migrant child if it isn’t immediately obvious that he or she will likely be granted asylum of some kind. That is the system currently in place for children from Mexico or Canada, but not for those from countries that don’t share a border with the United States, such as Guatemala, Honduras, and El Salvador, which account for the bulk of the more than 50,000 children who have been apprehended at the border since October. Under the current system, Central American kids taken into custody by border patrol agents are handed over to the Department of Health and Human Services, which then finds them housing and takes responsibility for medical care while their cases wind through the immigration courts. The law, signed by George W. Bush, was designed to prevent children who are the victims of violence or human trafficking from being returned to the dangerous situation that they fled. But it has had two key unintended consequences, according to the White House: It puts massive stress on an already heavily taxed immigration system, and it gives the false impression to people in the most violent and impoverished countries that their children will be allowed to stay in the United States permanently, which further fuels the influx. Obama says that if parents knew for certain that their children would be sent home almost as soon as they arrived on U.S. soil, then they’d decide against sending their kids trekking across the Mexican desert in the first place. The president is betting that these families are choosing to have the children come—for reasons ranging from better jobs to reuniting with family—and not because they believe they have no other choice. And that’s where the president’s wrong, according to the plan’s critics. “These parents and kids say that they understand how horrible the trips will be—that they might be robbed of their money or sexually abused, that they’ll be hungry and might die,” says Karen Tumlin, the managing attorney at the National Immigration Law Center. “And even after these kids get apprehended, they say they’d do it all again because of the violence and conditions in their home countries.” She and her fellow advocates argue that a parent who’s willing to pay to send her child with a “coyote” to the United States has already decided that doing anything—no matter how great the risk or low the odds—is better than doing nothing. Obama’s plan, critics say, won’t change that equation. That might sound like bombast, but the limited available evidence supports it. Honduras, Guatemala, and El Salvador have been increasingly ravaged by gang violence and are among the most dangerous countries in the world. Honduras, which accounted for the highest number of unaccompanied minors apprehended at the border in the past three years, now has the highest murder rate in the world. And, as Vox recently pointed out, the murder rates in all three countries were so high in 2012 that someone living in one of them was, statistically speaking, more likely to be murdered than a civilian living in Iraq at the height of the war was to be killed. Even assuming Obama’s proposed change would convince families against sending their kids to the border, there’s no guarantee that the message would ever reach Central America, where many households don’t have television, let alone the Internet. The proposal faces an uncertain fate in Congress, where some Democrats will be wary of taking a vote designed to speed the deportation of children, and where Republicans currently threatening to sue Obama for executive overreach will likely have little interest in giving the president the additional power he’s asking for. But even if lawmakers ultimately approve his proposal, there’s plenty to suggest that the outcome might not be any better than the current unsustainable status quo.